Crisis-hit Fifa should consider a new "credible external presidential candidate of high integrity" to replace the suspended Sepp Blatter. Thomas Bach, International Olympic Committee president, said Fifa must "regain credibility" after bans for Blatter, vice-president Michel Platini and secretary general Jerome Valcke. World football's governing body is investigating corruption allegations against the trio, who deny wrongdoing. "Enough is enough," Bach said. "Fifa must realise that this is now about more than just a list of candidates. This is also a structural problem and will not be solved simply by the election of a new president." The three men are provisionally suspended for 90 days while Fifa's ethics committee continues its investigation. Issa Hayatou, who heads Africa's football confederation (Caf), will act as Fifa president during Blatter's ban, but will not permanently replace him. South Korean ex-Fifa vice-president Chung Mong-joon said his six-year ban - also handed down on Thursday - was "politically motivated" to sabotage his presidential campaign. Where does this leave the Fifa presidential race? Blatter won a fifth consecutive Fifa presidential election in May, but quickly announced his decision to step down in the wake of widespread corruption allegations against 14 Fifa officials and associates. He is due to finish his term at a Fifa extraordinary congress on 26 February. Uefa president Platini, 60, says he refuses to believe the "farcical" development is designed to "crush" his candidacy and still plans to stand. He has the full backing of Uefa, which is holding an emergency meeting next week, while Football Association chairman Greg Dyke says the FA will withdraw its support for the former France international midfielder if he is found to have "behaved dishonestly". Chung, another leading candidate, maintained he would "expose the injustice" of his ban and help "bring about a true rebirth of Fifa" after describing the world football governing body as "like the sinking Titanic". Prince Ali bin al-Hussein of Jordan, pushed Blatter to a second round of voting in May's poll, winning 73 votes, before standing aside in the contest. The 39-year-old is free of any corruption allegations and former FA chairman David Bernstein told BBC Sport the Jordanian was a "person of repute". However, Bernstein insisted that football needed a choice of strong candidates "beyond reproach" that had "impeachable character and no baggage" - even if that meant looking outside of the sport. "Someone of a Seb Coe stature in football, a man of great reputation that has done a huge amount within and without the sport - that would be the best thing," said Bernstein. British former Olympic 1500m champion Lord Coe, 58, is the new president of the IAAF, the body that governs world athletics. "If we can't find that person we should look externally," added Bernstein. "This is a road crash we could see ahead of us. Blatter is a fool to himself to stay on for so long." Klaus Stoehlker, a close friend and advisor to Blatter, told the BBC that the suspended Fifa president had been "put on the touchline" but said he was confident that he would return to the helm of the organisation. His 90-day ban would expire in January. "He will be back early to hopefully organise the congress in 2016," Stoehlker said. "It is a pity that after 40 years in football he should have this happen to him. This is not the end. He will have the final word." Former England striker Gary Lineker supported Bach's calls for a new, untainted candidate in February's election. "It just seems that everybody in Fifa or Uefa involved in the running of the game is implicated in some way, or certainly suspicious of bad behaviour in some way, so who knows how far it goes or how many dominoes will fall," said the former Leicester, Tottenham and England striker. "The new leader needs to be somebody with integrity, above suspicion," he said. "They need to do a total clean sweep and reform Fifa." Lineker, 54, added: "Sepp Blatter is remarkable in the sense that he seems to keep wriggling away from things, but it seems to be catching up with him. The house of cards appears to be collapsing at Fifa which inevitably leads to the man at the top at some point. He seems to have had more lives than a cat." Sports Minister Tracey Crouch tweeted that Blatter's "time at the top is up" and he should resign immediately. She later added: "The only way forward for Fifa is full-scale reform. It has to be much more accountable, transparent and restore the faith of football fans across the world. And players' association Fifpro said in a statement: "A pattern has emerged that leaves little or no confidence in the ability of Fifa to reform from within." Blatter has been president of Fifa since 1998. He won a fifth term in May but just days later announced his intention to step down, amid corruption allegations after United States authorities indicted 14 Fifa officials and associates on bribery and racketeering charges. Former France international Platini is a vice-president of Fifa and has held the post of president at European confederation Uefa since 2007. He was once seen as a key ally of Blatter but their relationship deteriorated when Platini urged Blatter to step down earlier this year. Valcke is the general-secretary of Fifa and was effectively Blatter's second-in-command until he was suspended last month following allegations he was involved in a scheme to profit from the sale of World Cup tickets. Blatter is accused of signing a contract "unfavourable" to Fifa and making a "disloyal payment" to Platini, who is also president of European football's governing body - Uefa. 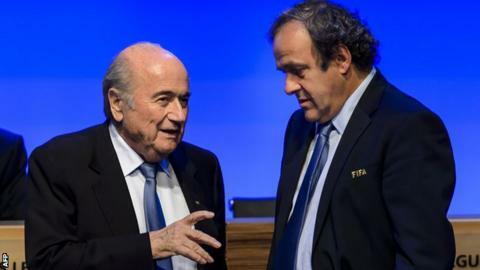 The ethics committee also opened an inquiry into Platini over the 2m euros (£1.35m) payment, which was made nine years after the 60-year-old carried out consultation work for Blatter. Valcke was already on gardening leave from his Fifa post following newspaper allegations last month which implicated the 54-year-old in a scheme to profit from the sale of World Cup tickets. "The crisis has extended to the heart of Fifa's leadership. Sepp Blatter, the man who has led Fifa since 1998 and has been at the centre of Fifa politics, is now facing suspension because of the criminal inquiry that was opened by Swiss authorities two weeks ago. "Many had put Fifa's future in the hands of Michel Platini and saw him as a figure to lead Fifa out of the crisis. He now has a big problem because he too has been suspended. He has confirmed that he has put in his application [for the presidency] but can he run? "Many are hoping that this is the cathartic moment that Fifa needs to go through so that it can emerge with its credibility restored - but that looks a long way in the future."